Indiana topped 500,000 digital engagements last Saturday, the day it disposed of Kentucky. A No. 5 seed knocking off a No. 4 seed in the NCAA Tournament isn’t unusual, but when the University of Kentucky is the victim, social buzz takes off for the winner—in this case, Indiana University. Data analytics firm ListenFirst Media found that the Hoosiers dominated online buzz from March 17 through 22 among squads that qualified for the Sweet 16 in the ongoing 2016 NCAA Men’s Division I Basketball Championship tournament, more than doubling the digital engagement rating of second-place University of Wisconsin. Syracuse University has seen engagements rise 164 percent since the NCAA Tournament tipped off. 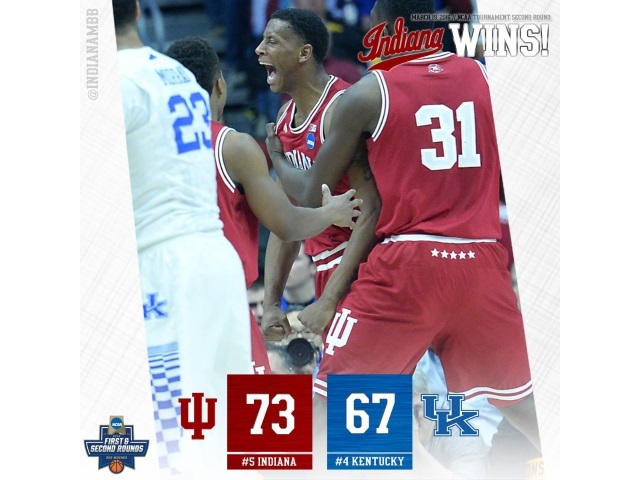 This photo (above) propelled Indiana to the No. 1 spot on Facebook during the time period analyzed by ListenFirst Media. The University of North Carolina topped Instagram overall, but the photo (below) that drew the most engagement came from Wisconsin. Duke University, the defending national champions, finished atop the Twitter list, but the tweet that drew the most buzz came from the Wisconsin Badgers. Readers: Which team will win it all? Image courtesy of Indiana Basketball Facebook page.